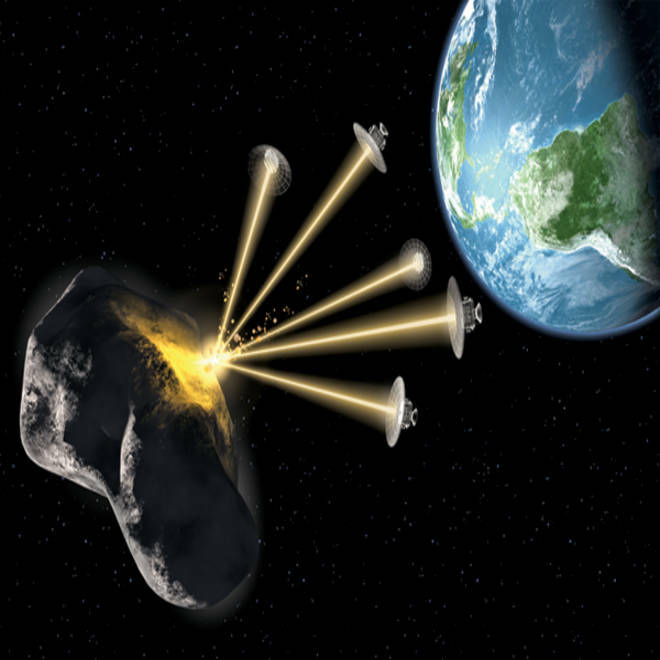 Researchers are looking into the possibility of sending a swarm of "laser bee" satellites to deflect a potentially hazardous asteroid, as shown in this artist's conception. How do you solve a problem like Apophis? For years, researchers have been tracking the asteroid to determine whether or not it could get into a catastrophic smash-up with Earth on Friday the 13th in April 2036. Last week, Russian reports suggested that Moscow is thinking about launching a probe to Apophis as early as 2015 to track the threat, but U.S. experts say it's the wrong idea for the wrong asteroid. So what's the right idea? They have a modest proposal that just might save the planet someday. First, here's a little more background on Apophis: The 885-foot-wide (270-meter-wide) space rock was discovered in 2004 and set alarm bells ringing when experts said it had a 1-in-40 chance of hitting Earth in 2036, due to the uncertainty about its orbit. Since then, astronomers have gotten a better fix on Apophis' parameters and set the chances of collision at 1 in 240,000 or so. Some uncertainty remains, because if the asteroid passes through a relatively small region of space known as a "keyhole" in 2029, Earth's gravitational pull would deflect its course just enough to guarantee the hit in 2036. Last week, the Russian Academy of Sciences recommended sending a small, radioisotope-powered probe with a radio beacon on board, so that astronomers could get a high-precision fix on Apophis' trajectory. "From a technical point of view, the mission could be started for implementation from 2015," the academy was quoted as saying by the RIA Novosti news service. I ran that idea past several experts on the asteroid threat, and the consensus was that you almost certainly wouldn't need that kind of mission to rule out a collision threat. Retired astronaut Rusty Schweickart, who has become deeply involved in studying potential threats from near-Earth objects and how to address them, noted that there's an excellent opportunity for high-precision, Earth-based observations of the asteroid coming up in early 2013. Another opportunity comes along in 2021. Chances are that the upcoming observations will turn Apophis into a complete non-threat. "Why, given this circumstance, the Russians would send a probe to Apophis in order to pin down its impact probability is indeed puzzling," he told me in an email. That's not to say a trip to Apophis would be totally useless. Far from it. "I would support a mission to study Apophis, either a lander or an 'orbiter' rendezvous mission," David Morrison, director of the SETI Institute's Carl Sagan Center for Study of Life in the Universe, wrote in email. "I wish the Russians luck. This fascinating object is a favorable target mostly because it will come so close to Earth in 2029, so that ground-based observations can be made in synergy with in situ measurements." Clark Chapman, a planetary scientist at the Southwest Research Institute, agreed that there are plenty of good scientific reasons for studying Apophis up close. "It is expected that the tidal effects on the body could change its characteristics markedly ... and I know a number of colleagues who would like to see such a mission," Chapman wrote. But based on RIA Novosti's report, the kind of mission that the Russians are contemplating may not fill the bill. In fact, it could do more harm than good. "I wouldn't totally dismiss the concerns about physically interacting with Apophis during its close approach," Chapman said. "If a spacecraft were actually to dock with it, there is the possibility of interfering with the natural responses that are of interest ... and, in the extremely low-probability case that Apophis were right at the threshold of passing through a keyhole, tampering with it could raise legal issues. I'm not aware that anyone has deeply thought through these concerns." All three of the experts are giving deep thought to another potentially threatening asteroid, a 460-foot-wide (140-meter-wide) rock that's been designated 2011 AG5. Right now, the rock has been given a 1-in-500 chance of hitting Earth on Feb. 5, 2040, due to the uncertainties about its orbit and its location relative to a cosmic keyhole in 2023. Schweickart has been calling on NASA to start making preliminary plans for a mission to 2011 AG5, just in case we need to get a better fix on its orbit between now and 2023. If observations over the next couple of years eliminate the possibility of a threat, hallelujah! But if they don't, and if we're still worried about AG5, we'll have a head start on the asteroid deflection campaign. "So it would seem that Russia is heading toward the wrong object!" Schweickart wrote. "There could hardly be a better example of the need, not currently in place, for international coordination when it comes to NEO [near-Earth object] impact analysis and deflection planning. So why aren't we?? Ask NASA. Please." Chapman had a similar assessment: "I agree with Rusty that precisely determining the orbit of Apophis seems like a low priority at this time. And I also agree that, as of now, 2011 AG5 is the near-Earth asteroid of interest." Back in February, NASA's Jet Propulsion Laboratory issued a statement noting that there'll be good opportunities for observations of 2011 AG5 in late 2013 and late 2015. "I fully expect we will be able to significantly reduce or rule out entirely any impact probability for the foreseeable future," said Don Yeomans, manager of NASA's Near Earth Object Program Office. Even if Apophis and 2011 AG5 turn out to be totally harmless, it's not such a bad idea to have the plans for a "reference mission" to a worrisome asteroid ready to put into effect. And if it turns out that a future asteroid really is on a collision course, what should we do about it? That brings us to another angle in the debate over near-Earth impacts: Some have suggested sending in the nukes. Others have proposed launching a "gravity tractor" to shepherd a threatening asteroid into a non-threatening orbit. Researchers at the University of Strathclyde in the Scottish city of Glasgow have been working on a different approach: using a swarm of solar-powered, laser-equipped satellites to blast away at the rock and deflect it. They say their system could be effective with objects that are smaller than Apophis — say, 150 feet (50 meters) across, like the object that is thought to have blasted a Siberian forest to bits in 1908. "We could reduce the threat posed by the potential collision with small- to medium-size objects using a flotilla of small agile spacecraft, each equipped with a highly efficient laser which is much more feasible than a single large spacecraft carrying a multi-megawatt [laser]," engineering professor Massimiliano Vasile said in a news release. "Our system is scalable, a larger asteroid would require adding one or more spacecraft to the flotilla, and intrinsically redundant. If one spacecraft fails, the others can continue." Schweickart said researchers have been talking about zapping asteroids for a few years. "I've never been able to convince myself that they've ever done any cost-effectiveness investigation ... assuming that they can actually solve the multitude of other technical issues inherent in the concept," he wrote. "It is difficult to take this proposal seriously when compared with the already available kinetic impact [KI] solution. About the only advantage it has over a simple kinetic impact is that it would presumably be able to execute a precise orbit change (vs. the KI approximate orbit change). However, in the last few years it has become generally accepted in the NEO deflection 'community' (such as it is!) that a gravity tractor capable 'observer' spacecraft would be pre-positioned to observe, verify, and ultimately precisely adjust (if necessary) the KI-generated orbit change. The cost, current availability and simplicity of the KI/GT deflection concept is still the 'standard' against which other systems will have to be compared... and especially re their cost effectiveness." Morrison agreed: "What is needed for deflection is to change the momentum of the asteroid in a controlled way. Surely a simple impact by a fast-moving interceptor is the most efficient way to do that, since the spacecraft is not required to brake and rendezvous, and then fly in formation with, the target." In a TEDx talk, the B612 Foundation's Ed Lu talks about how to deal with asteroid threats. Former astronaut Ed Lu, president and CEO of the B612 Foundation, also cast a vote for hitting an asteroid with something, if that's what needed to be done: "I couldn't agree more with Rusty's comment about how the real-life feasibility of such schemes needs to be taken into account. The same could be said of suggestions that asteroids could simply be 'painted.'" So it sounds as if the right course of action is to draw up the plans for a quick trip to a potentially hazardous asteroid, just in case we need some up-close reconnaissance, and working out a strategy for giving it a good whack if necessary. NASA's OSIRIS-Rex mission, due for launch in 2016, might serve as a good first step. The target for that $800 million mission is the asteroid 1999 RQ36, which has an ever-so-slight chance of threatening Earth in 2182. By then, we should have our anti-asteroid strategy well in hand. And who knows? We might even have to put the strategy into practice long before then. Are we on the right track to avoid the dinosaurs' fate? Where would you rank the asteroid threat on your list of worries? Feel free to register your opinion in the vote above, and/or the comment space below. "The observer spacecraft is more properly designated a 'transponder/gravity tractor' spacecraft ... the gravity tractor being potentially needed to adjust the NEO orbit slightly after the KI impact. Not either/or, but both/and. There should never be a KI deflection without a transponder/GT spacecraft in place before, during and after the KI impact. It's both/and." Connect with the Cosmic Log community by "liking" the log's Facebook page, following @b0yle on Twitter or following the Cosmic Log Google+ page. You can also check out "The Case for Pluto," my book about the controversial dwarf planet and the search for new worlds.